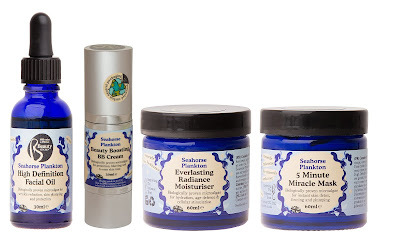 Beauty Kitchen have recently launched the Seahorse Plankton range of beauty products and I was eager to find out about them and the new range of products. The brains behind Beauty Kitchen is Jo Chidley. In 2010 she launched her first store in Glasgow offering 100% natural, 100% effective and affordable beauty products, these are now on sale in Holland and Barrett stores nationwide. All the products are reasonably priced with the Everlasting Radiance Moisturiser costing £19.99, a fraction of the cost of some leading face creams and a small price for an item that is entirely natural and has not been tested on animals. So what exactly is Seahorse Plankton and how do we, as the user benefit? What I love about this wondrous little blue pot of moisturiser is the smell, besides the seahorse plankton it also contains sea kelp, blue chamomile, angelica root and frankincense. When applied to the face, it glides on effortlessly and easily absorbs with no stickiness, leaving your skin feeling smooth and refreshed. After a week of using it my complexion looked a lot more radiant and hydrated and I felt a lot happier knowing that the product I was using was completely natural. You can buy the whole range of Beauty Kitchen Seahorse Plankton at Holland and Barrett or online at their website above. I was sent this item free of charge but the opinion is entirely my own.